Laura runs the Children & Teenage Yoga classes. She is a fully qualified & experienced teacher, who is accredited with Yoga Alliance. The Yoga Studio provides a perfect environment for Children and Teenage yoga classes. The students always settle quickly at the studio and often comment on how welcoming, calm and peaceful the atmosphere is. 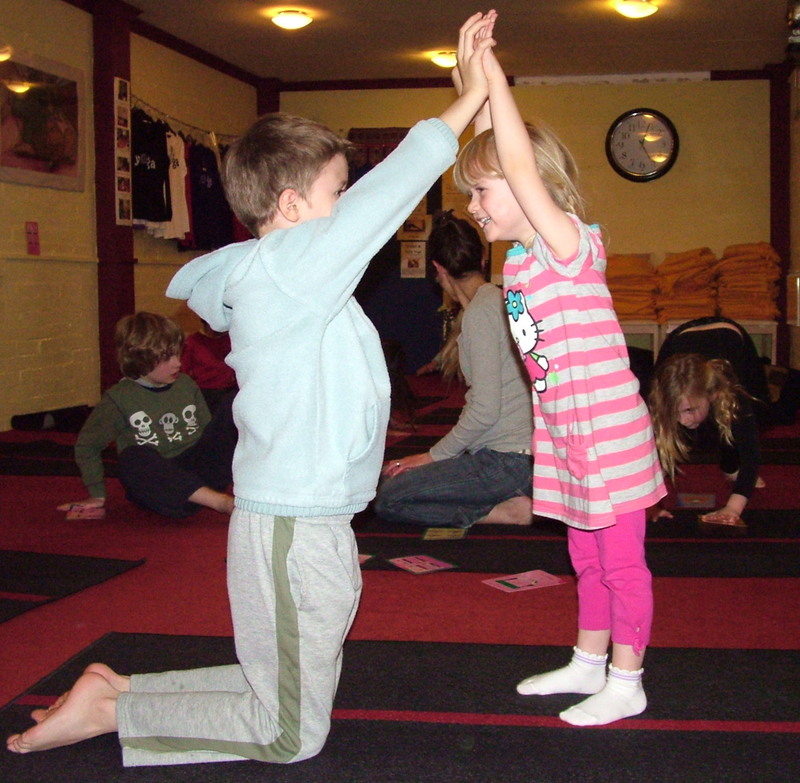 Both age groups are taught yoga breathing, postures and relaxations each week at an age appropriate level. Amongst other things, our classes provide opportunities for students to develop physical strength and flexibility, ease allergies and complaints such as asthma, reduce hyperactivity and anger, increase self confidence and self esteem and improve focus and concentration enhancing their capacity to learn. Classes are fun but focused. Students are encouraged to fully engage with their session, concentrating throughout, calmly working at their own pace without competition. The students are also encouraged to practice the skills they learn, during their studio sessions, throughout their daily lives to support them academically and emotionally. The students enjoy practicing with their peers and are helped to develop compassion and respect for themselves and one another. Practising yoga on a regular basis has helped me on a number of levels, such as the ability to concentrate, controlling my breathing as a measure of lowering stress levels as well as the increased strength the physical practise has given me. After practising yoga on a regular basis for quite some time now, I feel more balanced physically as well as mentally. The yoga definitely helps with that. "Both the girls have thoroughly enjoyed the class. Grishma came home went straight into the study, closed the door and finished her maths homework in 10 minutes without a single mistake!! We both believe that Yoga has given her the focus and determination"
"Pranavi is revising for her AS level exams in May. She came back very happy after her class and said she felt refreshed. So we are very grateful to the holiday lessons"
"My children initially started doing yoga at school. I was surprised and delighted by their enthusiasm. They were all very keen to do more out of school, so I took them to the Saraswati Yoga Studio as I liked the fact it was a specific yoga studio. Laura, who is the teacher for all my children is so kind, incredibly gentle and her patience astounds me (I'd love to have some of her patience!). They all absolutely love yoga at the studio. They love showing me all the poses they can do. I'm over the moon as I really feel doing yoga from a young age will help keep the body supple and pain free as they grow older; especially so for my son who does so many other sports. The cost of each class is also so reasonable. Many other classes charge so much more, and I wouldn't therefore be able to send all 3 children every week. I can't fault anything with the Saraswati Yoga Studio, Laura or the cost. I'm so happy my children attend and love it as much as they do." "I love yoga because it helps with the other sports I do (football, rugby. cricket) by strengthening up my body. It also helps me get to sleep at night." "I like yoga because it calms me down when I'm angry, and it's peaceful in the studio. I've always loved learning new poses and postures and I have gained strength from some of them. I really liked the way you relax and go into your own little world." "I love yoga because we do Lion Breath and Triangle pose. Lion breath it makes you not angry and it's really funny because you stick out your tongue! And Triangle pose because you get to bend sideways and I like bending sideways! You get to relax at the end. Laura is a really nice teacher. It's good for 6 year olds to do because they will get really healthy!"